This week, our picture is again news-related: it comes from the Gulf Coast, an area ravaged by Hurricane Katrina just weeks ago. We don't get hurricanes, but we do get serious storms and we certainly do get earthquakes. The Nisqually 2001 quake comes to mind. 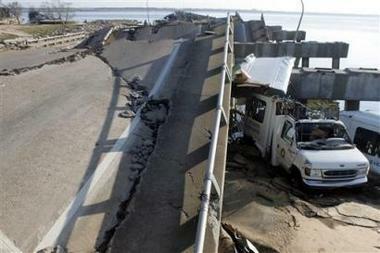 What you're looking at is a collapsed bridge which used to be part of U.S. Highway 90. This picture was taken Tuesday, August 30, 2005 around twenty four hours after the highway was hit by Hurricane Katrina in Biloxi, Mississippi. It's time to replace our unsturdy structures. Katrina ought to shake common sense into people who buy into the mindset that less government is more. They'll get their less government, all right -- just when they need it the most. For New Orleans, the wake-up call was last month's big hurricane. For Seattle, it will be the catastrophic earthquake that seismologists say is coming. "In New Orleans it was the levees that failed," a man on the other end of the phone says. "For us, it's the Alaskan Way Viaduct and the 520 bridge. Those are our levees." A massive earthquake could bring down the crumbling viaduct and render the state Route 520 bridge impassable, or worse. People would be killed if those structures collapsed. The ripple effect would clog Interstate 5 and Interstate 405, creating a regionwide parking lot. People would have trouble getting home. Ambulances and fire trucks would get stuck. "It will be easier to walk," the man on the phone predicts. The man ought to know -- he's King County Executive Ron Sims. "People have to be willing to invest in government so that it can protect the health and welfare and safety of people," Sims tells me. "Government has to be adequately funded so it can respond. New Orleans is what happens when you don't have a focus on government investment." What Sims is saying sounds obvious, especially coming in the wake of the recent killer hurricane down South. Western Washington hasn't had a Katrina-like event. Not yet. Strong applause to County Executive Sims for recognizing the danger, and kudos to Robert Jamieson for writing about it. We cannot afford any more Eyman or Eyman-like initiatives. (Initiative 912 might as well be an Eyman initiative). If you care about the future of Washington State - if you care about the safety of your fellow citizens - VOTE NO on Initiative 912. Seattle Times asks: Could you survive a disaster here? What if...it's Seattle and Washington State?